Do you lack passion and motivation on Monday morning? Are you sluggish or tense? If yes, you might have a case of the Monday Blues. People tend to have more stress on Mondays because they can be associated in our minds with the return to work — and thus a return to stress. And do you know that simply anticipating going into the office raises people’s levels of the stress hormone cortisol? The first thing to do is to ask yourself what's wrong. If you have the Monday Blues most weeks, then this is not something you should laugh off or just live with. It's a significant sign that you are unhappy at work and you need to fix it or move on and find another job. Try to make a list of the things that are bringing you down in your job. Maybe it’s a negative co-worker or a meeting with your boss first thing on Monday morning, or maybe it’s that you don’t feel challenged--or maybe it’s all of the above. In either case, clarifying what is bothering you can help you try to be active in finding solutions. It’s a way of empowering you to take charge and try to improve the situation. If you only suffer the occasional bout of mild Monday Blues, then you can do some things to successfully cheer yourself and others up on an otherwise dreary Monday. 2. Prepare for Monday on Friday. 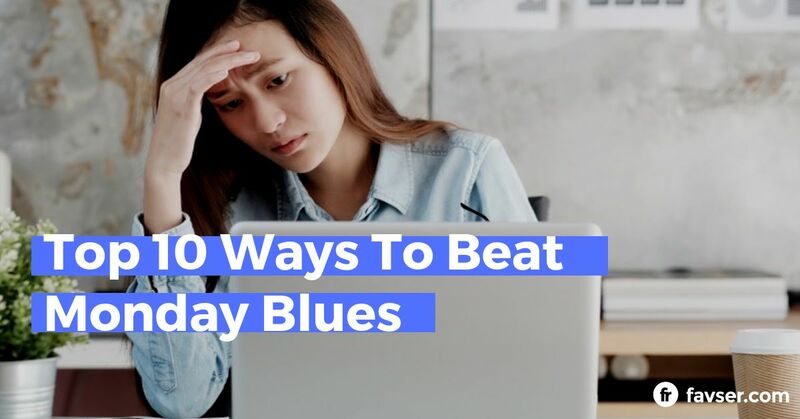 Mondays can be extra stressful from work that has potentially piled up from the previous week and, for many, can be challenging to jump right back in. To help combat that Monday morning anxiety, be sure to leave yourself as few dreadful tasks as possible on Friday afternoon. This is because by taking care of the things you least want to handle at the end of one work week, you're making the start of the next that much better. If you do have any unpleasant tasks awaiting your attention Monday morning, get them done as early as possible so that you don't spend the rest of the day procrastinating. Make that uncomfortable phone call, resolve that outstanding issue, or clean up that mess that's waiting for you. You'll feel a lot better once it's over. You’ll also want to make sure your calendar is up to date and synched, and you have a good view of and handle on your upcoming work week--especially Monday. What do you need to prepare for and get organized with? Get it done Friday, or by Sunday, if possible. 3. Make a list of the things you’re excited about. We often look at the week ahead of us and think of all the tough stuff we have to do and the difficult tasks ahead of us. Turn that around. Sunday evening, make a list of three things you look forward to at work that week. This might put you in a more positive mood. If you can't think of three things you look forward to, that might be an indication that you need to make some changes. 4. Unplug for the weekend. If possible, try to avoid checking work e-mail or voicemail over the weekend, especially if you're not going to respond until Monday anyway. It can be tempting to know what's waiting for you, but drawing clearly defined boundaries between work and personal time can help keep things in check. When you leave the office on Friday, leave your office problems there and focus on enjoying your time off. Sometimes going back to work on Monday feels especially frustrating because you let it creep into your off-time, and so it never even feels like you had a weekend at all. Go to bed a little early on Sunday night and be sure to get enough sleep so that you wake up feeling well-rested. If you're only running on a couple of hours of sleep, it's unlikely that you're going to feel good about going anywhere when the alarm goes off Monday morning. Although it might seem counter-intuitive, waking up an extra 15 to 30 minutes early on Monday morning can actually make going back to the office easier. Having a little more ‘me time’ instead of feeling like you're trapped in a time crunch can make that transition a little easier. Taking the time to enjoy a healthy breakfast, do some exercises, or take the dog for a walk can help you feel more centered for the rest of the day, and can help you remember that you're not a robot who just sleeps and works. Dress up, perk up and show up ready to be positive and help others be positive. Be the light and energy that makes others have a better day. Show and share your spirit, charisma and vibe and make yourself magnetic. Use Monday as the day to wear your favorite new outfit. This can help build your confidence around the office and might get you a few compliments from co-workers. Remember, when you look good, you feel good. Feeling good about yourself is half of the battle on Monday mornings, because rather than being deflated by work you want to face it with confidence. Start the week out with an attitude of gratitude. Take time to recognize and appreciate the things that you enjoy about work. This starts before you even get to work. To pump yourself up on your way in to work, try listening to your favorite songs. Think about the type of playlist you would create for a workout, and incorporate that same upbeat, high-energy music into your morning preparation or commute. When you get to the office, do your best not to be a complainer--and keep your Monday morning grumpiness to yourself. In the same vein, don't listen to other people's Monday gripes. Creating or contributing to a culture of complaining is no way to improve your attitude. Make a decision to turn negative reluctance and dread into a positive, productive and excited welcome to Monday energy. Start with Friday and make sure your desk is organized, and your work to-do list is ready to go for the following week. Take Sunday to rest, review and reward, but plan for and get ready to leap into Monday. If you’re able to be a source of positivity in the workplace, not only will you make your day more enjoyable, but you’ll also make the work environment better for those around you. 8. Make someone else happy. Make a vow to do something nice for someone else as soon as you get to work on Monday. Doing nice things for other people definitely can lift the spirits, and in this case, it could actually help shift the overall mood in your office. Paying it forward can yield great results all around. Research showed that one of the best ways to cheer yourself up is to make someone else happy. You might compliment a co-worker, do something nice for a customer, help out a stranger on the street or find some other way to make someone else's day a little better. 9. Keep your Monday schedule light. Knowing that Mondays are traditionally busy days at the office, a good strategy is keep you Monday schedule as clear as possible. When you’re planning meetings ahead, try to schedule them for Tuesdays and Wednesdays. This will help you to come into Monday with more ease from the weekend. Instead of tackling the biggest and most complicated tasks early on Monday, take some time for easier, more routine stuff. This might get you up and running and give you the energy for the hairier tasks. But beware: If you have too much free time—you’ll sit around "feeling blue”. 10. Have fun at work. Take it upon yourself to do things that you enjoy in the office on Monday. Maybe bring donuts for your colleagues or take a quick break to catch up with friend in the office. Sharing stories about the weekend with co-workers can be fun and also is a great way to strengthen your interoffice network. Try to schedule a weekly Monday coffee break or lunch with a friend. Create an event that you will look forward to on Mondays as a way to break up the day with some known positivity. At the very least, it gives you a chance to take a deep breath, talk with a friend, and regroup for the rest of the day.